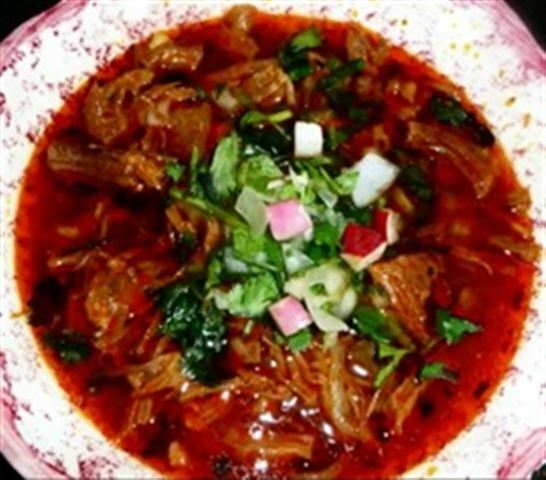 Birria is a Mexican dish from the state of Jalisco. The dish is a spicy stew, traditionally made from goat meat or mutton, but occasionally from beef or chicken. The dish is often served at celebratory occasions, such as weddings and baptisms, and holidays, such as Christmas and Easter. On hot griddle toast the ancho and guajillo chile and submerge in hot water. Let chiles sit for 20 minutes. Remove from water and puree in blender with a cup of warm water. Set aside. In a deep Dutch oven add the beef and ribs, water, onion, garlic cloves. Bring to boil and cook for 1 hour. At this point add the bay leaves, thyme, chile puree, cumin, oregano and salt/pepper simmer for 30 minutes. To make sauce, puree the garlic, vinegar and chile powder in a blender. Serve the stew in a nice bowl with a sprinkle of onion and cilantro and a squeeze of lime on top. Serve with corn tortillas and some of the sauce on the side as well. It looks good but some ingredients that are mentioned in the instructions are not in the ingredients list eg. vinegar, chile powder.